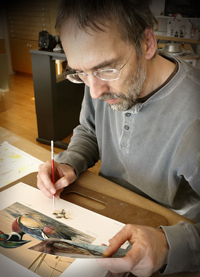 Joe Hautman's first experience as a professional artist came after he won the Federal Duck Stamp contest in 1991. 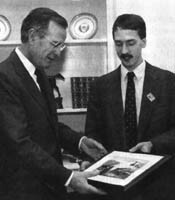 Although he had never sold a painting, he suddenly found himself visiting President George H. Bush in the Oval office, and receiving honors for his artistic achievements. From an early age Joe loved to draw and paint, but he soon became fascinated by the sciences as well. His artistic talents took a back seat during his academic career. He studied physics and astronomy at the University of Minnesota, and eventually earned a Ph.D. in Theoretical Physics from the University of Michigan. In the midst of an active research career, Joe began to enter the Federal Duck Stamp contest as a way to exercise his artistic skills. His surprise victory in the 1991 contest provided the incentive he needed to return professionally to his first love. He now paints full-time and finds his art career as challenging and fulfilling as his science research. Joe again won the Federal contest for the 2002,2008 and 2012 duck stamps, and recently became a five-time winner with his rendition of a Trumpeter Swans which will be on the 2017 stamp. See some of Joe's recent works and works in progress in his studio.